Going even bigger with Drukhari! 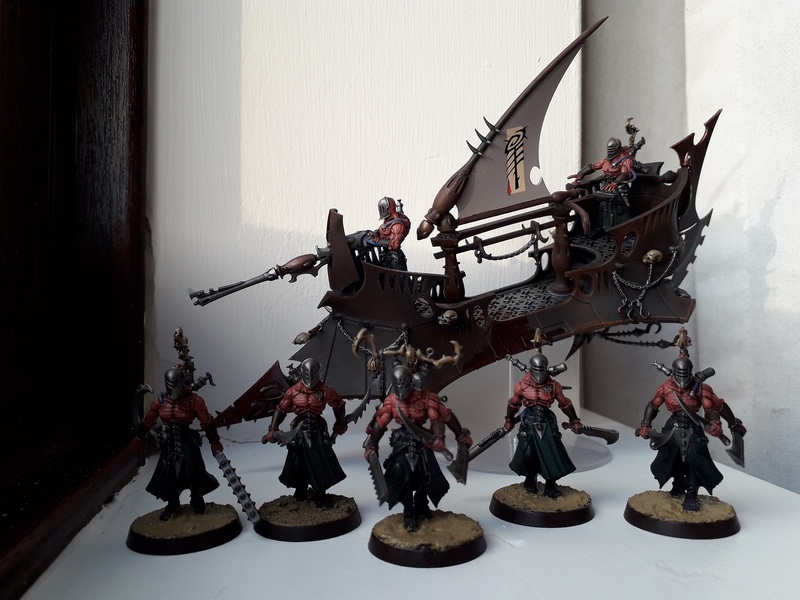 Following my post about the eldar Corsairs at the weekend, I thought it about time to get the main event posted up here on the blog: let’s take a look at my latest list development, the 2000-point Drukhari army! This is quite exciting for me, as I feel like it’s been an army list in the making for a good number of months now! I’ve not played with my Dark Eldar nearly as much as I would have liked by this point in 8th edition, mainly because I’ve been struggling to come up with a way of organising my forces that I feel is right for me. I’m not interested in the competitive builds, but rather want something that I would actually like to play on the table. So late last week I spent some time cataloging all of the painted (and unpainted) miniatures that I currently have, before sorting them into an army that I can see myself playing. It’s quite a standard list of Kabal battalion, Cult outrider, and Coven patrol, netting me a total of 9 command points. I’ve still not really embraced the whole stratagems thing, feeling the need to maximise my pool of points wherever I can. Rather, I have been preferring to build lists that I want to play, and seeing if they can be organised after the fact for CP benefits. I am, of course, playing Kabal of the Obsidian Rose, as that is how I’ve been painting my army since I started it back in 7th edition. I’ve got the classic combination of Kabalites in Raiders, and my Archons in Venoms – the Warlord being attended by his Court. I’ve also slipped a Ravager in there, because of course. So there are just six drops there to start with, and I should have some pretty decent mobile firepower to start chewing through the enemy from the off. In contrast to most of my 8th edition lists, I’ve gone for just a patrol detachment of Coven, having 10 Wracks in a Raider and a Haemonculus in a Venom. This detachment, being so greatly reduced as it is, really feels a bit pointless on some levels, as I don’t have the mass threat of my big creatures or large blobs of Wracks to beat down in close combat. I’m seeing these guys primarily as a supporting unit for the Cult. 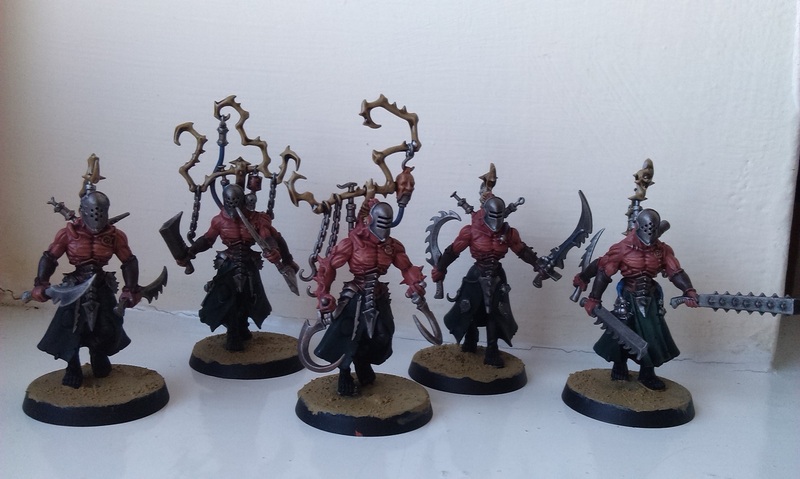 Wych Cults are an aspect of the army with which I have very little experience, and so the main focus for me in writing up this list has been to produce something that will allow me to change that. I’ve got an Outrider detachment because I principally have fast attack options painted, but there are also the squad of Wyches, and the Razorwing (which can fit into a Cult or Kabal detachment). I’d initially wanted to include a Venom in here also, but ended up without the points. However, the Coven really is a very mutable portion of the list, and so I could very quickly see myself expand on the Cult part to eclipse their Coven counterparts. For this increased Cult list, I do rather have my work cut out. There are an additional 15 models to paint, which doesn’t sound too bad of course, but still! I do like the addition of the Beasts, as I think that’s an aspect that I’d like to explore a bit more if possible. The Beastmaster himself should be a good addition aesthetically, as he also rides a skyboard like the Hellions. The Clawed Fiend looks really nice on paper, making 5 S5 attacks hitting on 4s, with an additional attack once he’s taken a wound. I do have two of these models, though only one of them built – I think it could be quite fun to have a band of three of them with the Beastmaster (though not forming a single unit), going off to just blend their way through infantry where they’ll hopefully be hitting on 3s. The Beastmaster looks like he’s a decent enough support character in terms of his stat line – he can take drugs which might be useful when distributing them among the band, but his abilities otherwise basically allow for you to include Beasts in the army, and granting re-rolls of 1 to them if they’re within 6″. But he’s got splinter pods for 2 shooting attacks, and then carries an agoniser to make three attacks in the fight phase. It might be useful, I guess we’ll have to see! I’ve only used a mass Cult once, and apart from the fact the Hellions were a fairly impressive unit for their Hit and Run ability, nothing else stood out. Of course, that could have been due to the fact I was pitting just one unit of Wyches against a mob of Orks! I’ve always thought that Wyches are the close combat unit to throw against a unit that doesn’t want to be in combat – their No Escape rule really speaks to that, after all. Coven units are the close combat units to use against dedicated enemy close combat units, so it does feel a little worrying stripping myself of the Covens! I’ve also got enough points left over to give my Ravager a shock prow! This list is a bit different to the one I talked about back in December, as it has more of a focus on the Coven than the Cult – if you haven’t already, I can recommend you taking a look at that to see what my thoughts were a little over three months ago! 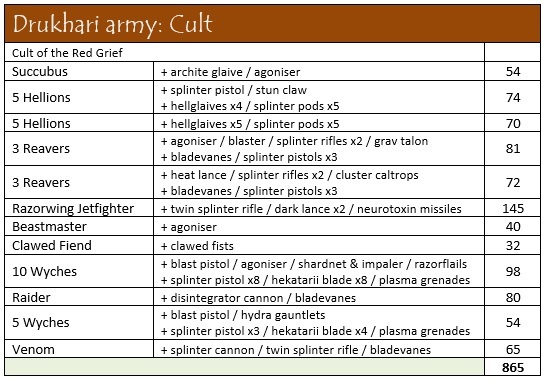 Of course, going down the enhanced Cult route isn’t my only option for the army, as I am also considering the Eldar Corsairs option as discussed at the weekend. Should I go for that, I would then be able to fit in two more Reaver jetbikes to make one squad of five, with the addition of cluster caltrops to one squad and a grav-talon on the other. While I suppose going the other way and enhancing the Covens is a third option for this list, I suppose the list as discussed back in December would be a better fit for that one. My fourth option, of course, is Murder Clowns, so make sure to check back later in the week for some thoughts on including Harlequins in the army! 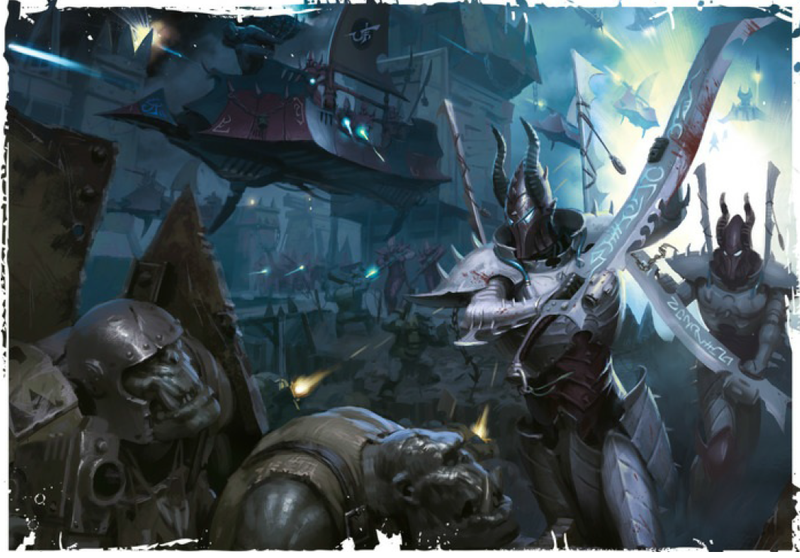 Author spalanzPosted on March 5, 2019 March 5, 2019 Categories WarhammerTags Dark Eldar, Drukhari, Games Workshop, Haemonculus Covens, Kabalite Warriors, Warhammer 40k, Wych Cult1 Comment on Going even bigger with Drukhari! Last week, I finally got to have my first game with the new Drukhari Codex – well, it’s not all that new anymore, I guess! I had tried a very small scale game on the August bank holiday, but this was a 1500-point match with the new Ork Codex, as we were both somewhat getting used to the way these armies play now that they have their own books. My first thoughts are still that the Drukhari army is difficult to make work now that we’re forced to keep detachments focused in either Kabal, Cult or Coven in order to benefit from the Obsessions. I mean, sure, there is the Raiding Party rule that allows you to take Patrol detachments of each, so you can technically field whatever you want that way, but the HQ and troop requirement there becomes a tax if all you want to do is take some Reavers or some Hellions along with the rest of the force. Don’t get me wrong, it’s thematic as all hell, but I wish there were some kind of way they could implement it where, say, up to three non-Kabal units could be included in a Kabal detachment and not break it for Obsessions (those non-Kabal units just wouldn’t benefit from those Obsessions). I’ve come a long way from my very first thoughts on the book! I took a Kabal battalion and a Coven battalion, and really fancied taking maybe a squad of Hellions or a squad of Reavers, but didn’t want to do so in an auxiliary slot and lose a command point for it. Like I say, I love the theme they’ve brought out here, but I really dislike how restrictive it can be. It can also be confusing as all hell, as you try to juggle the Coven-specific or Kabal-specific stratagems among the army. 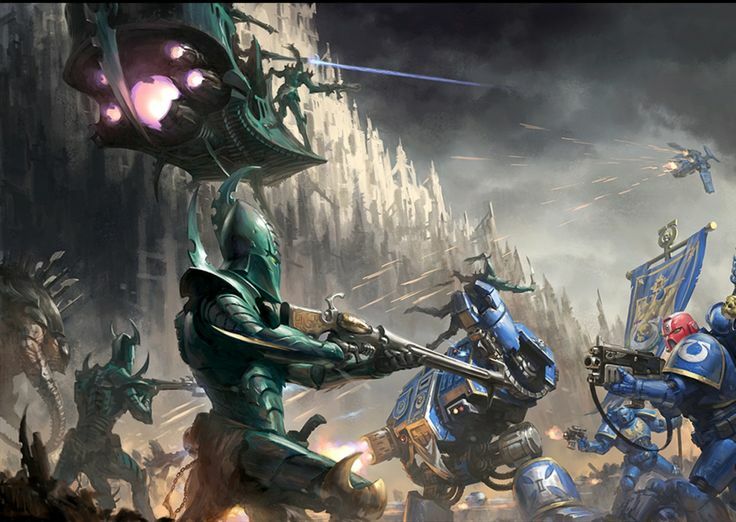 While in one respect it’s really no different from a Space Marines army that has a detachment of Ultramarines and a detachment of White Scars, it goes broader than the Chapter Tactics style of things, as you have to remember what buffs affect what units. At least, I found it quite confusing! I’ve mentioned before how I feel that 8th edition seems to be a lot about the horde style of army, and this is partly due to the way that troops have been brought back to the fore. No longer a tax, troops are actually quite good, and I feel this is nothing but a good thing for myself, as I love the miniatures aspect of this miniatures game. I don’t go in for a lot of hulking behemoths or whatever! But 8th edition is also a lot about the overlapping auras, and I’ve been thinking about both of these aspects as I’ve gone about re-writing my lists for my Dark Eldar army. Lastly, I think it’s important to look at the Stratagems available to the Dark Eldar when building a list. 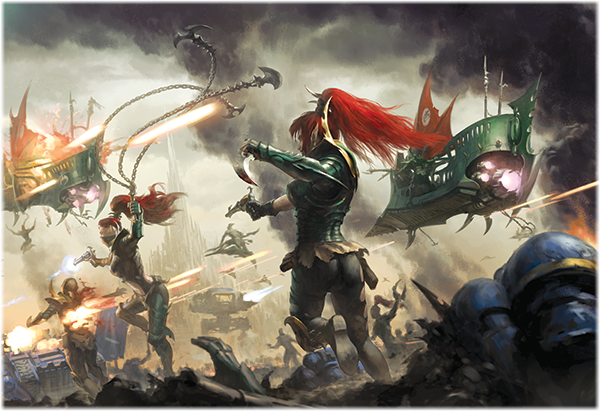 To some extent this is obvious when writing an army list, but there are a wide variety of Dark Eldar Stratagems that can be very important to the overall game plan, whereas other armies might only want to use a couple of them multiple times. First of all, then, I’ve picked a unit that I think it would be cool to build the list around. This has previously been my starting point when building my Necron army list, as it provides a good basis to get the rest of the army going. For this list, that unit is the Ravager. Equipped with three disintegrator cannons, bladevanes and a shockprow, the idea behind this is that the Ravager will fire all three cannons in the shooting phase, before charging into melee with its three attacks before falling back and shooting in the next phase. 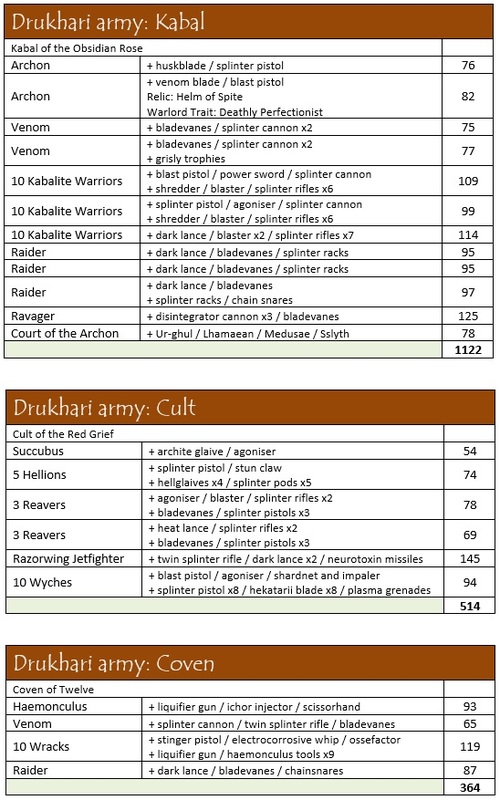 In a 2000 point list, 126 points isn’t that considerable a sink, considering a lot of Dark Eldar units are actually quite cheap, so it isn’t going to break my heart if this unit doesn’t survive very long. The idea of a Ravager charging into melee got me thinking about that perhaps being able to take Overwatch in order to allow a melee orientated unit also get into the fight. 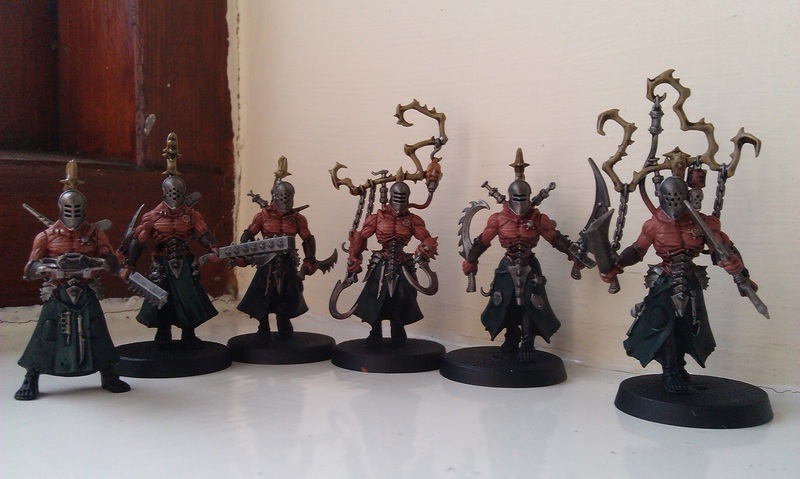 I recently picked up some Incubi, so have been considering these, as a squad of five chaps will make 16 attacks in close combat. Previously, I’d been intending to use some kitbashed Wood Elves for my Incubi, but I’ve decided that I want to use the actual models now, even if they are finecast! Their weapons look slightly unimpressive on paper, as strength 4 on a close combat specialist feels just average, but the four attacks made by the Klaivex have the potential to deal 3 damage each, if the roll made for them is 6+. They only have the DRUKHARI keyword, so can’t benefit from any of the auras dished out by the Archon, but they do have their own stratagem, Onslaught, which makes each unmodified 6 to hit score two attacks rather than one. So there is potential there, I feel. They do also benefit nicely from Drazhar being nearby, getting +1 to hit within 6″ of him, but for now I am leaving him out of the list. A squad of 5 is 80 points, so again, they will slot into my 2000-point list nicely. Okay, so I’ve got a Ravager going around the field, being followed by Incubi, but they will obviously need transport to keep up with the assault boat. I’m going to stick them in a Venom – there will no doubt be a lot of these skimmers in the list – but I’m keeping it cheap with only one splinter cannon, and then the stock twin splinter rifle and bladevanes. I think this vehicle will be primarily a transport taxi, and just deliver its payload before zooming off around the battlefield doing whatever is required. So we’re looking at something around 270 points so far, which is fine. Now for some of the more general stuff. Kabalite Warriors. I’ve probably said this before, but if I was forced to only ever paint one unit forever, it would be endless Kabalite Warriors. This kit is quite beautiful, and while this is going to sound incredibly arrogant, I’m really pleased with the paint job that I have achieved on my guys so far! While there are plenty of options available to them with the new Codex, I still like to keep them fairly basic and cheap, as they will die so easily. I wouldn’t say I use them as a screen per se, but I do field Warriors much as a suicide unit if the enemy is getting a bit too close to me. I had a phase where I was putting dark lances in the squad, but when a weapon costs more than three times the points of the person wielding it, you have to think twice! For my first squad, I’m giving the Sybarite a blast pistol and agoniser, and a phantasm grenade launcher. It’s a fairly standard load-out for me, I think, but I particularly like the grenade launcher for allowing me to use the Torment Grenades Stratagem. I like to kit out my Warriors for weight of fire, and so have included both a splinter cannon and a shredder, with the rest wielding the generic splinter rifles, for a grand total of 95 points. It’s a fairly decent squad size and cost, I think – any troops choice that ends up below 100 points is alright in my book! Though naturally, you can’t take Warriors without popping them in a Raider, as that is just the absolute requirement of a Dark Eldar force! All of my Raiders are so far equipped with dark lances, bladevanes and splinter racks, and so the transport costs as much as the Warriors within. But that’s alright. Splinter racks are a new upgrade in the Codex that allow you to score 2 hits instead of 1 when you roll a 6+ to hit with a splinter rifle or pistol from within the Raider. Something that I generally forget about (even though I remember to roll for the splinter cannon separately, I forget why I’m doing it!) it’s a really handy upgrade that will, hopefully, allow some shots to explode – especially when we’re throwing fists full of dice in Rapid Fire range. I like to use the Fire and Fade stratagem with my Raiders, for a proper Drukhari Drive-By, getting up close for the Rapid Fire, then moving 7″ away afterwards. While Enhanced Aethersails is a useful one for also getting the vehicle into close range, it needs to Advance, and I don’t think I want to put myself at -1 to hit as a result of that, so tend to leave this one alone. When looking for stuff that will buff the army, it is very difficult due to the subdivisions within the force. Normally, you might expect to find an elite unit that would also grant some sort of aid to the troops units, but there are no <Kabal> elite choices, meaning the only thing outside of Stratagems and Power from Pain that affects Kabalite units is the Archon, who allows re-rolls to hit rolls of 1. Which would be fine, and is a lot better than the Index Archon, who merely allowed nearby units to use his Leadership, but most of the time, units are embarked within transports, so I feel there is something lacking for the army here. However, being a Dark Eldar player means playing around handicaps like this, and so we move on! I want a couple more mobile squads of Kabalite Warriors, so I’m going to include two more, both of them in Raiders. I think, at some point, I’ll start putting disintegrator cannons on my boats, but for the time being, I’m keeping it all darklight, all the time. My second Kabalite squad will be built along similar lines to the first, with a splinter cannon for horde control, another shredder, but this time I’m also including a blaster – something else the Codex allows now is for up to two special weapons as well as a heavy weapon – while the Sybarite is going to have just a splinter pistol and agoniser. Mixing it up like this is only four more points than the first squad, so it’s not too bad. For the third unit, I’m again using a splinter cannon and a shredder, but I’m keeping it cheap and not going fancy with my Sybarite. Doing this brings the cost of the squad down to just 78 points, which is quite useful, and gives a better target for the Raider’s splinter racks. So far, the army totals 1059 points, and can be taken entirely within a Kabal detachment. Fantastic! Now then, this is where I think things may get interesting, as I’m quite torn between sticking with my usual Coven build, or else going down the route of Wych Cults. I don’t have many of the latter models painted up, and I’m not honestly sure of what I’m doing with them. Covens, on the other hand, have long been favourites, and I have a significant number built and ready. At the start of the year, I wanted to go into the Cult route, and had planned almost a biker army of Reavers – I think I built up a dozen jetbikes, but have so far only started to work on three of them. I’ve also given thought to including masses of Wyches with Hellion/Reaver support. Wych Cults are definitely an avenue that I want to explore with the army. However, I think I need more experience with the Cults before I can think about them too critically. For the time being, then, I’m going to stick with my Coven delights. The two Coven Monsters, Talos and Cronos, are both delightful models that I have enjoyed since the Codex supplement gave us the delightful Dark Artisan formation. The Talos has recently gotten quite the reputation at tournament level, and I’m expecting to see something happen to it in this year’s Chapter Approved, but for now at least, I’m happy to keep going with my current build. I’ve got two Talos now, along with a Cronos, all three of them kitted out to try and be just monstrous. The second Talos I built late last year has a stinger pod and twin liquifier gun, in an attempt to be a bit more anti-horde (each weapon is Assault 2D6), while the haywire blasters on the first Talos still do some pretty decent work, even considering the way haywire changed from 7th to 8th edition. The Cronos is definitely more a support engine, as it allows all DRUKHARI to re-roll wound rolls of 1 in the Fight phase. 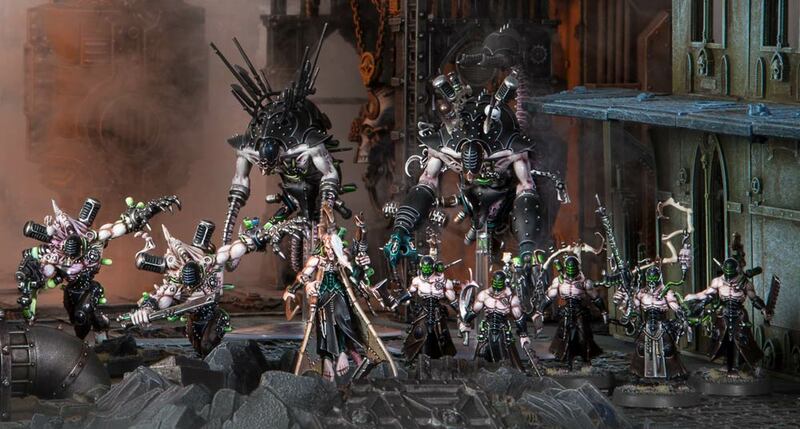 I might well go running my Cronos up with the Incubi, although his ability affecting all models in the army makes a good case for using a few more of these bad boys! I’m taking my Haemonculus in order to make a Spearhead detachment with the three monsters, and also to make use of the Fleshcraft stratagem that gives a monster within 3″ of a Haemonculus D3 lost wounds at the end of the Movement phase. Always handy to heal your monsters, after all. To keep him a little bit safe, I’ve given the Haemonculus his own Venom, to deliver him right where I need him to ensure his Master of Pain ability will buff the Toughness of as many models as possible. Taking advantage of the fact that I can still include troops in a Spearhead detachment, I’ll also be bringing some Wracks to the party, inside their very own Raider. This time, however, the Raider is equipped with chain-snares rather than splinter racks – bringing the cost down to 87. Well, it’s better than nothing! For the Wracks, I’m giving the Acothyst some fancy stuff: an electrocorrosive whip and a stinger pistol. We’ve also got an ossefactor in there, but I’ve foregone the second special weapon in order to keep the points down. However, the Coven portion of the list so far only totals 625 points, so I could definitely fit some more Wracks in there! I think I’ll take my favourite sniper-Acothyst this time, with the Hexrifle and Scissorhand, though this time I may well add in a liquifier gun and keep everybody else just basic with tools. Another ten-man squad will therefore add 114 points to the detachment, but these are at least on foot. In total, then, we’re looking at an army that totals 1798 points up to this stage, giving me just 202 points left to play with. It’s time, then, to start looking at organising the Kabal section into an actual detachment, so I’m naturally looking at a battalion here. I need another HQ, and Drazhar is just too expensive for my purposes, so I’m going to go for a second Archon. I have actually built up the now-classic conversion, which you can see here, and he costs a grand total of 80 points (the power lance isn’t an option for him to take, in the new Codex, so he’s armed simply with a blast pistol). I’ve been considering putting another Venom into the list for him, and then just spending the left over points on Kabalite Warriors – I could include a five-man squad with another blaster, as well as a Venom with two splinter cannons to bring the total of the army up to 2000 exactly. So I might as well do that, I reckon! So I’ve got two distinct detachments, and have ended up with an army that is remarkably similar to my 1500 force that I used last week! I still need to paint up some units for it, of course, but in the main, it’s pretty basic stuff! I think there are just six units that I need to actually paint (and, in the case of the Incubi, build), and potentially some of the special weapons within the Kabalite Warriors squads, so with a bit of luck, it shouldn’t be too much work in the new year to get this going. For the Kabal, I am of course going Kabal of the Obsidian Rose, which increases the range on all of my Assault, Heavy and Rapid Fire weapons by 6″. This has proven to be incredibly useful so far, especially for the Rapid Fire stuff, though there were several instances where getting the extra range was really good for my shredders as well. My Warlord is the Archon with the Huskblade, and rather than giving him the Deathly Perfectionist trait, I’ve chosen to give him Soul Thirst, to get +1 Attack on the charge, and allowing him to regain 1 lost wound when he slays an enemy model in combat. I did say he was going to be built for combat! He’s also getting the relic, replacing his splinter pistol with the Parasite’s Kiss, which gives it an extra shot, -2AP and an extra point of damage, as well as adding 2 to the wound rolls for it. If that wasn’t enough, he can also regain 1 lost wound when he kills an enemy model with the weapon. Nice! For the Covens, I’m going Coven of Twelve, which improves the AP of all melee weapons by 1. There are 27 melee weapons spread among my Coven, with the electrocorrosive whip and macro scalpels being the worst at -2AP, so they’re now -3AP, but all of my Wracks now have -1AP on their haemonculus tools, and my Wracks will be making 42 attacks in total! That’s before we factor in the monsters and the Haemonculus, not forgetting the Venom and Raider are both classed as Coven of Twelve units! Delicious! For all this, however, the army at its heart is, I feel, still a very Dark Eldar army. In the new year, I want to work on writing a Wych Cult list that will be able to slot in, directly replacing the Coven portion of this list, but I feel there will be a lot of theory-crafting needed before I can comfortably work on that. Aside from the Reavers, I’ve only used Cult units once, and I seem to remember the Hellions as being the most interesting part of that. I’ve got 739 points to play with, give or take, so it will be interesting to see what I can do on that side of the fence! Anyway, this blog has run a little too long, I feel – hopefully it’s been at least mildly entertaining and/or informative! I still think it’s pretty hilarious to think that I spent so much time complaining about how restrictive list-building is with the new Codex, then proceeded to build a list that was really quite straightforward to produce, as well as remarkably similar to the sorts of lists I’ve been building all year since the book landed. Obviously I’ve become inured to the suffering of having to force my army into these constraints! More previews for the upcoming Drukhari codex are out today, with a look at the flesh crafters of the Haemonculus Covens! Three distinct Covens get their own Obsession (Chapter Tactic), which is a nice way to keep things distinct without going too crazy, in my view! So, without further ado, let’s take a look at what’s on offer! The Prophets of Flesh, Urien Rakarth’s own coven, improve the Insensible to Pain invuln that all coven units get to 4+, which is very handy. Even better if, like the article says, you have a nearby Haemonculus granting those units +1 toughness, too! Prophets of Flesh Wracks can be brought back to full strength through a very powerful 2CP stratagem, which shouldn’t be too difficult to pull off if you’re fielding loads of patrol detachments for their additional command points – to say nothing of their Warlord Trait, that allows you to get D3 additional CPs before the battle begins!! The Dark Creed have a sort of Fear-effect, subtracting 1 from the Leadership of enemy models within 6″. I mean, sure, there must be a lot of different things you can do with this, but I’m just not the sort of player who wants to try and make my opponent’s army run away. There are other ways to reduce Leadership that stack with this Obsession, but I’m just not sure it’s going to be an effective strategy overall – we’re Dark Eldar, if we need to survive to get to the Morale phase, we’ll need a lot more! What I will say about the Dark Creed, however, is their stratagems are some of the best-named in the entire game! “Pray they don’t take you alive” reduces leadership army-wide if the Warlord is killed in the Fight phase, and “An esoteric kill, delivered from afar” allows you to target characters in the shooting phase, even if they’re not the closest enemy model. Wonderful! Finally, we have the Coven of Twelve, who improve the AP value of all weapons (except relics) by 1. This is something that I like, and they have a nice stratagem that allows you to shoot into melee, so long as both friendly units are part of the same Coven. The downside here is any hits of 1 are resolved against your own guys, but hopefully that won’t be happening too often! 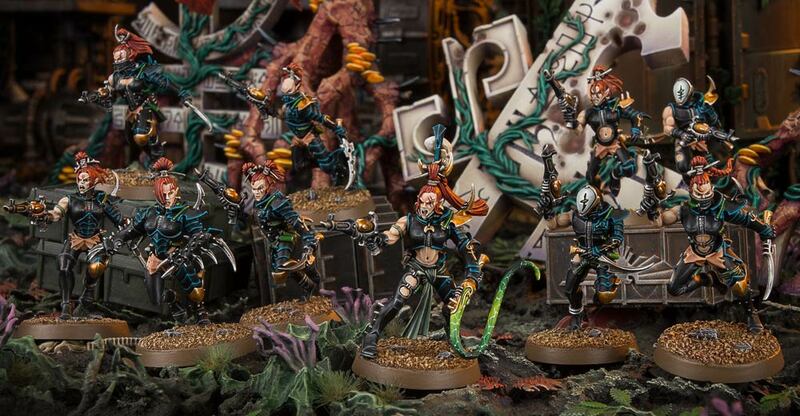 While I do love the Haemonculus Covens as part of my Drukhari army, I’ve never really gone for a specific paint scheme to match an established Coven as I have with my Kabal. I think the coven of the Black Descent is probably the closest in terms of the paint scheme, though I’m leaning quite heavily towards making them Coven of Twelve after today’s preview!! Let’s see what comes along tomorrow then – it’s got to be Wyches, right? Well today has been pretty awesome, I have to say! One of those days where I’ve just mooched through, and enjoyed myself immensely! To start with, I’ve been painting again, for the first time in a long time! I mentioned last week that I’ve been listening to a lot of the Command Zone podcasts, and I think having a lot of fairly long podcasts to listen to allowed me to get on with this stuff! I’d already painted the skin on these Wracks last weekend, following the GW quick tip video, so I spent the bulk of the day painting up the rest of the models – I’m fairly happy with how they look right now, though I might do a few extra tweaks to them in the coming days. In the main, I want to get them based, though, and then at least they’ll look just so much more, well, finished! It’s going to be tough! 36 models shouldn’t be so difficult to get done in three and a half months, but this oath was made six weeks ago, and so far I’ve not had the motivation to do a great deal of it! I need to get back into painting with a bit more regularity, anyway, and see how far I can get! Finally, I’ve been watching some more Studio Ghibli this evening, the classic Princess Mononoke. It was an ex-girlfriend who got me into these movies, and the first time I watched this particular one, I remember being particularly ill, and didn’t really take a lot of it in. Consequently, I’d always thought it was a little bit odd and disjointed, but that’s mainly my own perception of it than any real reflection on the film. 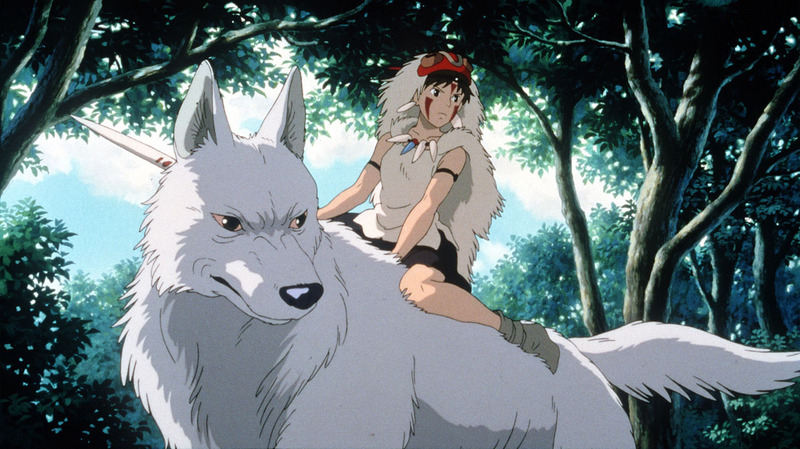 Like a lot of Studio Ghibli films, Princess Mononoke deals with the consequences of industrialisation on the landscape, though here it’s quite a visceral message that Miyazaki is putting across. We follow Ashitaka as he saves his village from a demonically-possessed boar spirit, but falls foul of the curse himself in doing so. He travels into the west in order to find the forest spirit, and thus cure this curse. He arrives at Irontown, and discovers that that the the townspeople, led by Lady Eboshi, are clearing the nearby forest in order to dig for iron. This has brought them into conflict with the many forest gods, including the wolf-goddess Moro and her human daughter San, dubbed Princess Mononoke. Eboshi and the townsfolk wage their war against the forest gods, and manage to decapitate the forest spirit, which proves almost fatal for the surrounding countryside as he transforms from a life-giving spirit into one that causes death to all he touches. Ashitaka and San manage to restore his head, and thus peace to the area, though the film ends with a distinct tension still between the natural world and humanity. The story is actually a lot more complex than this, of course, but hopefully you get the picture. It’s actually a really dark movie, and I think if you approach it with the same mindset as Spirited Away or My Neighbour Totoro, you’re in for quite a surprise. It’s certainly nuanced, with no clear good-and-evil to root for. Sure, you may hate Eboshi and her ruthless drive to eliminate the forest spirits in the name of progress, but she is also shown in a more benevolent light as the leader of her people, and she does appear to learn some lessons over the course of the movie. While I think overall the film had a profound message against the continual drive of industrialisation at the expense of the natural world, under the immediate surface I think there is more to be said for a give-and-take relationship between nature and mankind, that we should attempt to live in harmony with each other as opposed to standing still. It’s a very complex film, and if you haven’t watched it already, I can highly recommend you do so! Author spalanzPosted on April 1, 2017 Categories other stuff, WarhammerTags Dark Eldar, Games Workshop, Haemonculus Covens, Princess Mononoke, Studio Ghibli, Warhammer 40k3 Comments on Awesome Saturday!